Digital nomads – the next darling of tourism destinations worldwide? Millennials exit stage left, a new character is taking the travel industry spotlight. With laptop in hand and only the essentials on the back, this traveller is partial to Airbnb and OTA searches – and she is an avid activity seeker. Are digital nomads poised to become the next big thing for the travel industry? Digital nomads are becoming important to some destinations as a new type of visitor. Not only do digital nomads represent value for local communities through consumption of good and services, they should be considered important for the social currency they wield as travel and lifestyle influencers. Tourism destinations and suppliers are just beginning to understand the digital nomad market. Location independence means elusiveness, so how do you promote a destination to a location-independent traveller? Pieter Levels, nomadic indie maker-preneur and developer of Nomad List, a crowdsourced database of world cities ranked by and for digital nomads, has gone so far as to predict 1 billion digital nomads by 2035. However, estimates of the number of digital nomads vary widely and WYSE Travel Confederation’s is far more modest. Variation is due to surveys working with different client bases, but the advantage of a global study like WYSE Travel Confederation’s New Horizons Survey is being able to estimate the size of the worldwide travelling digital nomad population. In 2017, WYSE Travel Confederation asked more than 57,000 young travellers about their travel style and 0.6% of respondents reported themselves as a ‘digital nomad’ rather than other traditional travel identities like ‘backpacker’ or ‘tourist’. While 0.6% may sound small within all youth travel, it represents about 1.8 million international trips per year. The main drivers of digital nomadism are cheap travel, freelance work and the gig economy, and the rise of the collaborative or sharing economy. Sure, it makes sense that digital nomads manage their location independence by making extensive use of Airbnb (56% used on their last main trip), but they are also the most likely to book air travel online (85%) and tend to use OTAs to book accommodation (55%). Eager to experience the locale, digital nomads engaged in more in-destination activities than most other types of young travellers – female digital nomads being even more avid experience consumers. 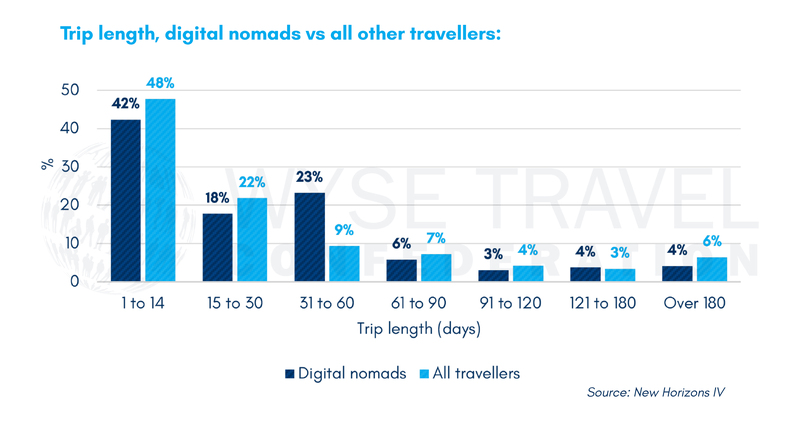 Digital nomads tend to take slightly shorter trips, most commonly 1 to 14 days (42%). There was a secondary peak of trips lasting 31 to 60 days (23%). Short trips could be the result of demand for at least some location-dependent work. Even so, digital nomad travel spend tends to be high, at nearly €3,400 on the last trip. While there are indications that digital nomads are valuable visitors for destinations to attract, the tendency for digital nomads to offer travel products themselves via the collaborative economy changes the dynamic, representing what some small suppliers may see as competition or a sort of negative value for the cities they make use of but do not have legal residence and working rights in. While still a small proportion of travellers, there are indications that the digital nomad market is growing fast. Destinations are clearly thinking about how to attract digital nomads, collaborating with other destinations to encourage ‘digital nomad swaps’, offering incentives to re-locate remote enterprises, developing a new type of ‘nomad visa’, and touting the wellness and productivity benefits of working in a beautiful and inspiring location. Accommodation providers like Selina are actively developing mixed-use spaces with digital nomads specifically in mind and companies like Remote Year offer work and travel tribes to hook up and head out with. What the travel industry and digital nomads will spawn next remains to be seen, but WYSE Travel Confederation will keep watching. Read more about the digital nomad trend in New Horizons IV: A global study of the youth and student traveller or join the discussion at the World Youth and Student Travel Conference (WYSTC) 18-21 September 2018 in Edinburgh, Scotland. New Horizons is the only recurring global survey of the youth, student and educational travel market. The aim of the study is to provide an overview of the youth travel market, which WYSE Travel Confederation and UNWTO have estimated to account for 23% of international arrivals and USD 285 billion annually.